The Wisconsin Badgers are preparing for the possibility of not having starting center Dan Voltz when they face Purdue in Big Ten action at Camp Randall Stadium on Saturday. Voltz suffered a sprained left elbow in Wisconsin’s come-from-behind victory at Nebraska last Saturday. Voltz has been limited in practice so far this week, but expects to get more time on the field as the week goes on. 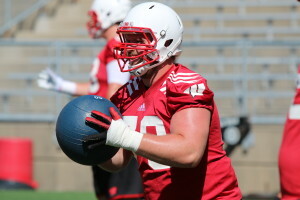 Guard Michael Deiter practiced at center on Tuesday, just in case Voltz isn’t ready to go on Sunday. The Badgers (4-2, 1-1) will host the Purdue Boilermakers (1-5, 0-2) on Saturday.